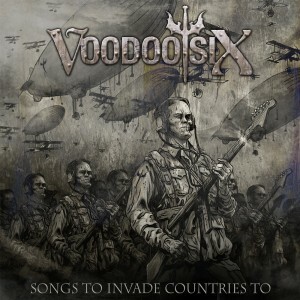 At the end of May, Voodoo Six have a very big day - not only do they release their new album, 'Songs to invade countries to', they also kick off their European tour supporting Iron Maiden, a tour that will keep them on the road till the end of July and includes appearances at the Graspop and Download festivals. I've seen them play live several times including gigs with Cinderella, Reckless Love and Michael Monroe, and they've impressed every time, so I had high expectations for this new album. Brief comments on a few of the songs. The album kicks off with 'Fallen knives'. Opening with a distinctive bass line this song has a really catchy groove to it. It's a great hard rock song and an excellent start to the album. 'Lead me on' is one of my favourites on the album - a hard rock ballad - with the emphasis more on the hard rock part than the ballad, so if you were expecting a slow acoustic number then think again - yes it may be a ballad but it's got plenty of balls too. Another highlight of the album is 'Stop'. Great guitar, heavy bass and a nice groove combine to make a really impressive song. This really is an impressive album. I alread knew that Vooodoo Six are a great live band, so it's nice to see that their albums are just as impressive. I look forward to hearing some of these songs played live.